“… We are Waitaha. We are the water containers of the Creator therefore we have been imbued with the many forms of waters containing the many gifts of all that is in the Universe” … p. 147 Whispers of Waitaha. Keeping a promise which was almost 6500 years old. Ko Makere Aroha Anikaitawa Ruka Te Korako ahau. 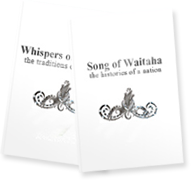 2007, was the year of the Wai Taha Spirit Carriers. I had the privilege and honour to return 6500 years after my eponymous Ancestress Hine Te Kakara o Titiraukura left the shores of the Turtle Island. My husband Te Porohau Ruka Te Korako and I embarked on this journey together. I walked it physically and he walked it spiritually with me. And so the prophecy was to return and touch the sacred memory stones of our people within Turtle Island. For it was from this island that our ancestors left so long ago. The matriarch announced that the time had come for a specially selected group of people to sail away from the Turtle to re establish the Nation in a far off place deep in the South Pacific, to retain the knowledge, the geneological lines and the way of life of Peace with all things, all peoples, all places. (this is spoken of in the first chapters of Whispers). The essence of the prophecy was to keep the promise made by those ones who left all that time ago that we would never forget them and that one day in the mists of time, a direct descendant of the Matriarch, would return to do just that, awaken the spirit by keeping the promise. There were four other very significant places to Waitaha that needed to be visited. Three in North America and one in Mexico. The distances were vast and one wondered how this could happen but spirit provided as is always the case. Another part of the work was to visit as many sites of grief as possible to lift and free the spirits trapped in the trauma of those times. In the ceremonies involved with these visits the spirits were released enabling the land and the people to begin the healing process. Such was the power of the old ones who walked unseen with us on this journey. Visiting the lands of the ancient ones, to pray with, to sing with, to walk among, to feel, to look to touch this ancient spirit in these magnificent places was an honour and indeed a privilege, truly gifts left by the ancestors, he taonga tuku iho. My first footsteps in this land was to visit the people of the Okanagan of British Columbia. It was a spontaneous journey, a response to the call of the spirit to take a copy each of the Song and the Whispers to these people, 4 of whom I had met some weeks before at a conference in California. This journey was blessed with snow in the most appropriate of places but out of season. I was carrying the peace stone, pounamu, to gift to these people. My heart sang when we were travelling the high pass towards Penticton and Ohinehuka (snow)began to fall, much to the consternation of my travelling companions. (they got used to this phenomena in the end). And so the greenstone was blessed by the snow before the gifting to the people, a true blessing in our traditions. The journey was further blessed by 2 other ‘snowy’ occurances. Once out of a magnificent clear evening sky during the placing of a related stone on a bluff above Lake Okanagan and again the following dawn when we woke to snow and it snowed from Princeton to the coast, news of which hit national headlines in the States. People were still talking about it at end of that summer down in Santa Cruz!!! And so I was crowned the Snow Queen!!! A few days after I was introduced to the Great Grandson of Big Foot, a chief of the Oglala Sioux of 1889 and so the calling to visit Wounded Knee was made and the commitment to visit other places of trauma was confirmed by the old ones. And so began the journey. This sacred of sacred journeys began on May 4 and ended 28 days later on June 1, 2007.In my role we were to visit the four ancient prayer sites in the Land of the Turtle to awaken the spirit in these places, to awaken the memory of the ancient ones and to free the spirits of the recent ancestors in order for them to heal and for the land and the descendants to begin their healing. I travelled with 2 companions, a male and a female, whose combined knowledge of the lands, the peoples and the languages were invaluable to this whole journey. They were steadfast and true to the essence of this journey. They were totally dedicated and supportive and respectful of the sacredness of such a journey. And we travelled unnoticed in a special waka (vehicle) disguised as a white van. Two other companions travelled with us in spirit. One on the island in the North West Pacific, and one deep down in the South Pacific in Aotearoa, New Zealand. We were asked to visit the Long House of the Coast Salish people of Laconner, Washington. Here we were met and blessed by Elders and wisdom keepers of the local tribes. Aunty Vi Hilbert, beloved Skagit Elder, Aunty Skarla of the Lummi Nation and Johnny Moses and family. Snow blessed us on the first day of this journey also. We travelled through to Wyoming, across to South Dakota, through to Denver, Colardo. We flew out to Ohio and back and then continued to drive through to Texas, through New Mexico to Arizona and up to Utah. We flew from Salt Lake City to Mexico City and back to continue driving back up to Washington and home having touched the four sacred sites to Waitaha. We covered almost 8000 miles in that time. Each day brought unexpected blessings. Every day. From the one rainy day and the spectacular gifts that we received, to the small remnant of snow in the desert at another sacred site we visited. We were alone at almost all of these places except for the soft breezes and sometimes under the gaze of a big cat (we saw telltale footprints and other evidence of their close presence) as we walked the ancient canyon floor of Horseshoe Canyon to the Gallery where 12 foot images of the ancient ones greeted us on the sunbaked walls to the Hopi family who were selling food and crafts to raise money for their daughter to attend a Ziggy Marley concert that night, to the little Chip Monk that appeared miraculously out of the grass at the saddest of saddest places where we were numb with the grief, this little creature blessed us with its presence to lift our spirits to complete the task at hand there, to the Red Hawk feather which was lying directly in our path as we were walking out of another grief stricken place the wonder of which lifted our spirits again and it goes on and on, blessing after blessing, to the 3 beautiful butterflies which flew around us as we sat and rested at the top of the Sun Pyramid of Te Otihuacan in Mexico after having completed an ancient ceremony honouring the ancestors of our families. A few days later I had an email from a dear friend (from New Zealand) who said she had seen 3 beautiful butterflies during her meditation and she wondered if we were on the Sun Pryamid atTe Otihuacan on that same day!! And then we were welcomed back to the place we left from by our dear friends and family in the most humbling of welcoming ceremonies I have ever had the privilege of participating in. The poignancy of the occasion and the grace and dignity by which it was conducted will forever be etched in my mind as the homefolks dutifully removed the dust of exhaustion from our minds, hearts, bodys and souls. It was the epitomy of aroha, compassion, respect, joy and humility. I feel so honoured to have been able to partake of this journey. I am indebted to dear friends and family who made this possible. I am deeply grateful for the humble companions I had the honour of travelling with. I pay tribute to my dearest husband, Te Porohau, who held the mauri of this sacred of journeys with my sister Sandy. For without them this would not have been achievable. There were not three who journeyed through these lands, touched these sacred places, prayed and sang to honour the ancient ancestors, there were five, the perfect hand to make it happen. E mihi nei We give grace. I feel blessed to hear this, thank you for coming and all you have done, to help clear the lands and waters. I will pray everyday for the waters and mother earth.